Radio-controlled (RC) aircraft are tremendous fun at all skill levels. This guide looks at the smallest RC planes, including micro and ultra-micro options. There are 8 reviews here that are short, informative, and written in plain English. Read this quick intro if you’re new to flying RC airplanes. It explains the pros and cons of smaller models and what you need to know to make the best buying decisions. High-average flight time, 4-directional flight, fast battery charging. RTF, 2.4 GHz radio system, decent range, crash-resistant EPP foam. Beginner-friendly features, brushless motor, SAFE Select mode, LED lights. Drones have taken much of the spotlight away from RC planes in recent years, but why? They both fly, and pilots operate them using handheld controllers. Well, several unique features separate these machines that appeal to people in different ways. Most model aircraft pilots have flown drones, yet few drone enthusiasts have experience with RC planes. That’s pretty much where the similarity ends between the model type. Those who fly RC planes belong to a different hobby culture. The main attraction of drones is their ease of use and filming capability. Some people like to race them, and others fly camera-less quadcopters. Even so, aerial photography and video is a drone’s biggest attraction. So, the differences between RC planes and drones relates to the experience. 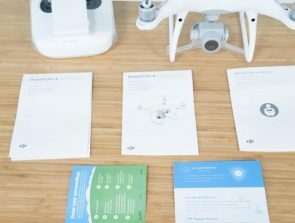 Drones are much easier to fly than airplanes and RC helicopters, and thus have broader appeal. 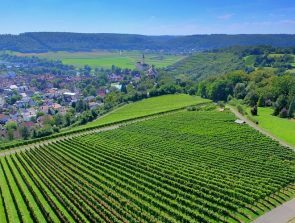 Many newer drones can make independent decisions and function with little or no pilot input. That’s not attractive to plane fans at all. RC fixed-wing plane buffs like to be in control, to feel the flight, and to hone in on their flying skills. Some cheaper, toy-grade RC planes use infrared (IR) controllers. Radio Frequency (RF) control is generally better. However, RF control is not always necessary if you plan to fly mostly indoors. Remember, some of the smaller RC planes are affordable beginner crafts. Their IR controllers help to keep the costs down. The reviews show all areas where a model shines and where it may fall short. Add anything to the list above that applies to you specifically. Try to have realistic expectations with the entry-level, low-budget models to avoid disappointment. The Best Budget pick goes to the Cessna 781 Palm-Sized Micro. 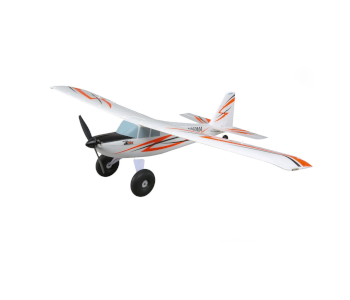 It’s a small ready-to-fly (RTF) RC plane that’s ideal for beginners. The model is stable and easy to fly even for younger children. 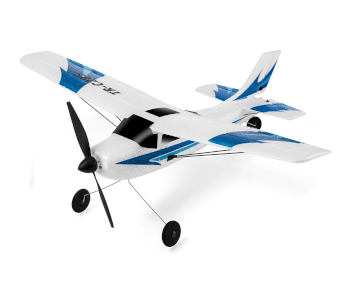 Consider the Cessna 781 Micro RC if you want a lightweight indoor trainer plane. One of the best features is that it withstands those inevitable beginner crashes. The carbon framework and durable EPP material give the model a rubbery feel. That’s a good thing as the plane gently bounces off everything it hits. Not all indoor aircraft can boast the same crash-resistance. The Cessna 781 provides 4 directional flight, i.e., ascending, descending, left, and right turns. It has a high-average flight time of 15 minutes. That may sound short to newbies, but it’s impressive compared to a lot of model planes in its class. The fast 25 minute charging via the transmitter (controller) is even more impressive. The range is 30 ft. (10 M) which is more than enough for indoor fun. It’s possible to fly this micro-sized plane outdoors but only on windless, overcast days. It’s too light to control even in a gentle breeze. Also, bright sunlight can interfere with the infrared (IR) transmitter signal. For these reasons its best used mostly as an indoor RC airplane. 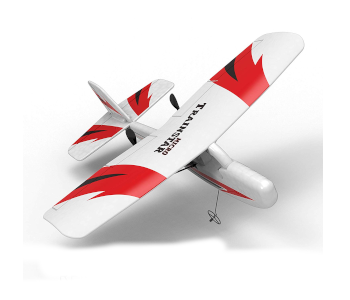 Our Best Value small RC plane is the Volantex V761-1 Firstar Mini, a ready-to-fly RTF model. That means it arrives fully-assembled and ready to use right out of the box. 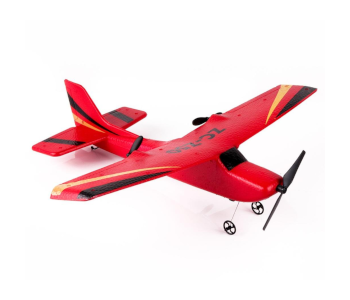 The Volantex V761-1 Firstar Mini is an easy to operate, ultra-lightweight RC airplane. It comes ready-to-fly (RTF) and includes a 2.4Ghz radio-frequency (RF) controller. RF systems don’t suffer from sunlight or other interference like infrared (IR) transmitters. 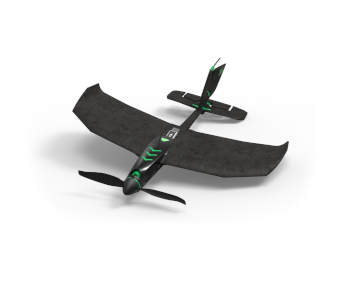 The RF controller and 6-axis gyro mean you can fly this bird outdoors on bright days, even with a little wind. The flight time is a remarkable 25 minutes on a single charge. The control distance is decent at around 328 ft. (100 M). Battery charging only takes 60 minutes which is also reasonable. The plane uses EPP foam material for its build which makes it resistant to newbie crashes. There’s a lot to like considering how affordable this model is and its appeal as a trainer aircraft. The 3 channel (CH) restriction is the only con with the Volantex V761-1 Firstar Mini. A 3CH plane is ideal for raw beginners but not advanced beginner pilots and above. The aerobatic flight restrictions of a 3CH model can soon become boring for some RC plane fans. The 3 E-flite UMX Timber Ultra-Micro fully-assembled Bind-N-Fly (BNF) RC plane makes our Top Pick. It’s a beautiful model that has the ability to take off and land in tight spaces. They call it an ultra-micro, but it’s not in the palm-sized category of some models (see specs). The plane boasts plenty of beginner-friendly characteristics, though. It flies like a bird outdoors and in larger indoor spaces. The over-sized wheels and functional flaps help to reduce the plane’s speed. That’s how it can take off and land in short distances. E-flite’s UMX Timber has a lightweight, precision build and powerful brushless 3000Kv motor. The SAFE Select mode is a welcome feature for novice pilots. It provides a degree of flight stability with self-leveling, bank angle restrictions, and pitch caps. The bright LED lights add to a more realistic experience. LEDs include navigation lights, landing lights, beacons, and wing-tip strobes. This is a bind-n-fly (BNF) model which is a con for some and a pro for those who exploit BNF. BNF means you need to buy extras if you don’t already have them. They include a DSMX/Dsm2 radio transmitter, a 200-280mah 2S LiPo battery, and a compatible charger. Another con is the landing gear. It may dig into the fuselage on harsher landings which might cause a little cosmetic damage. The Z50 Gyro is a budget-friendly, ready-to-fly (RTF) remote control micro RC plane. It’s an ideal first-time option for younger kids who want to learn how to fly model aircraft. The Z50 is super-lightweight at just over an ounce, but it’s also crash-resistant thanks to EPP foam. EPP is the preferred material for a lot of these models due to its light and durable properties. A built-in gyro helps to steady the craft and makes it easier for entry-level pilots to fly. 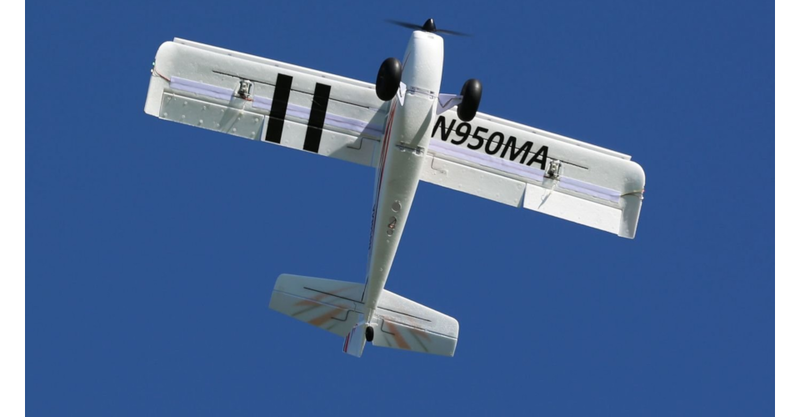 It’s even possible to perform a few basic aerobatic maneuvers despite the plane’s simplicity. This affordable model has a decent flight time of around 20 minutes on a single charge. And the 328 ft. (100 M) range is more than adequate for a plane in its class. Battery charging takes about an hour. The plane operates on 2 channels (CH) and that’s a pro and a con. It’s good because it makes flying incredibly simple for beginners. The downside is that control is too easy and can soon become boring for the pilot. More channels equal more flight control and flying options. Even so, it’s an affordable choice and should act as a stepping stone to 3 or 4 channel models. Another drawback is that the Z50 only weighs 1.09 oz., so it can’t handle flying outdoors in anything above a light breeze. 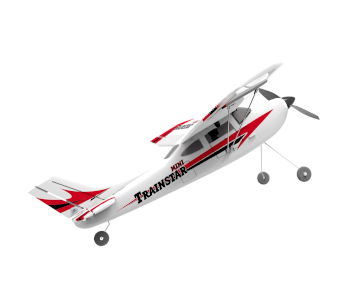 Next up is the affordable Trainstar Micro small RC plane for beginners. You can have this puppy out of the box and in the air just 2 minutes after unpacking it. The model can fly indoors and outside. Newbies to RC aircraft should consider the VOLANTEXRC Traninstar Micro. It’s another budget-friendly ready-to-fly (RTF) small RC plane and a perfect first-time training craft. You don’t have to worry about bad weather days if you have space to fly indoors. It’s a tough little bird too. The model stands up well to newbie crashes thanks to the durable, flexible EPP material. The Traninstar Micro can fly outdoors but only on windless days. It’s too small and lightweight to handle anything above a light breeze. The basic 2 channel controller makes this bird super easy to operate at the beginner level. However, older children will soon find the restrictive flight control boring. Therefore, it’s better to choose the Traninstar Micro for younger kids with lower expectations. Meet the POCO DIVO, another capable Mini Trainstar RC Glider Plane. This tiny model has more to offer than many of its rivals. It’s 3 flight modes (see below) certainly add to its broader appeal. This is an excellent entry-level plane for pilots who want a small, lightweight model. It has a 3 channel 2.4GHz controller with full elevator, rudder, and throttle controls. The 6-axis self-stabilizing gyro keeps the craft steady in Beginner Mode even in light winds. Learners ready for the next level can choose from the Intermediate and Expert modes. This plane is a step up from the previous two picks. Another welcome feature is the model’s smooth gliding function. And the durable EPP Shock-resistant material ensures it doesn’t break up in a crash. You can expect around 20 minutes of flight time on a single charge and a range of 300 ft. (100 M). Charging time is less impressive though (see below). The flight time is reasonable for an RC plane in its class, but the 3+ hour charging is a pain. 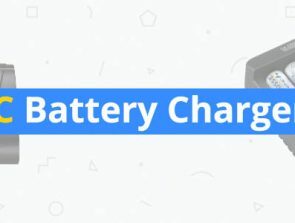 A longer charging time means users need more batteries to continue the fun. Another setback is that some of the parts don’t stand up to crash landings very well. The main culprits are the prop shaft and wheels that pop off. That makes the model more suitable for the advanced beginner than the raw novice. 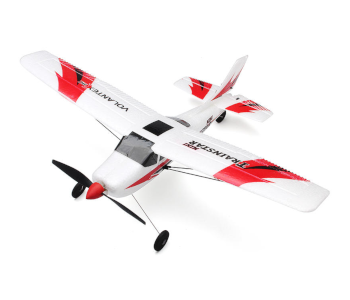 This model is the Top Race 3 channel RC airplane for novice and intermediate pilots. 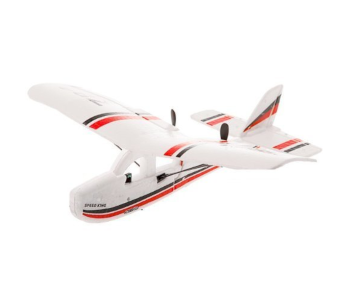 It’s a fully-assembled, ready-to-fly (RTF) model that comes with three flight modes. The TR-C285 is an incredible plane that caters to beginners, intermediate, and expert users. Different level modes mean trainee pilots don’t need a new plane each time they progress. There’s plenty of potential to hone in on one’s skills with the TR-C285 before moving to a 4 channel model. The flight time and charging times are average at 15 minutes and 90 minutes respectively. This plane has a superb gliding function and a robust build to protect it in a crash landing or collision. Its control rods are made from steel and pre-attached to the model’s servos. The main body is made from lightweight, EPP shock-resistant material. You can only expect 12–15 minutes flight time on a single charge. That’s almost half what some of the other models on this page can achieve. The charging time is around 90 minutes which is on the high side of average. New users will need to invest in extra batteries to keep the fun going. The other downside is that the landing gear is a tad fragile and prone to come off with rougher landings. Last on our list of small, lightweight RC planes is the SmartPlane Pro. It’s a tiny, stunt racing aircraft that can do a lot of cool flight maneuvers. It’s not cheap, though, but is its high price tag justified? It’s the unique style and features of this micro plane that separate if from all others. 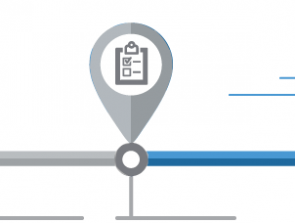 The model comes ready-to-fly (RTF) providing you have access to a regular iOS or Android smartphone. You then need to download the Tobyrich Smart Plane Pro app, and you’re good to go. There are two easy control options, ‘Tilt’ and ‘Joystick.’ The app also lets pilots choose flying modes based on skill level. Tilt mode is where you use hand movements to fly while holding the smartphone. The virtual joysticks are on the phone’s screen and represent a gamepad style controller. Either way is intuitive and undemanding, and which you use depends on preference. There’s even an Interactive Flight School for those who prefer a little pre-flight training. The pre-programmed stunts look impressive but take no skills to perform. Not that you need to let on about that. Aerial tricks include 90° hover, loop, helicopter, and a speed boost. This RC plane is more robust than it looks and can withstand quite a bit of punishment. The body uses a material called DURINUM that’s super durable. The fuselage is made from reinforced carbon fiber and equally sturdy. This RC plane is small yet expensive. Many RC aircraft fans won’t be able to justify its price tag. That’s unless they’re willing to spend so much on so little, size-wise. The flight time is poor at just 12 minutes maximum. The fast 20 minute charging time is better news. Another negative is the lack of user feedback. That means relying more on the maker’s sales pages than the experience of others.